This field can be also used to find the users that are (or not) members. Applying a filter “Member Since is set” will list all the users with a membership. 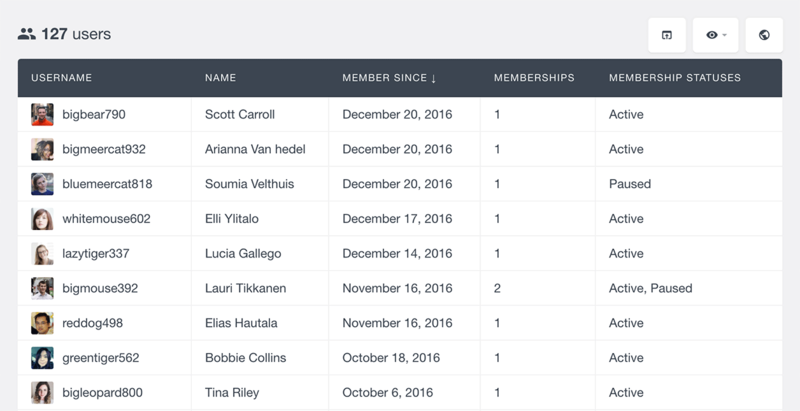 In a similar way, applying a filter “Member Since is not set” will list all the regular WordPress users that don’t have a membership. Each WooCommerce membership has a status, such as “Active” or “Cancelled”. 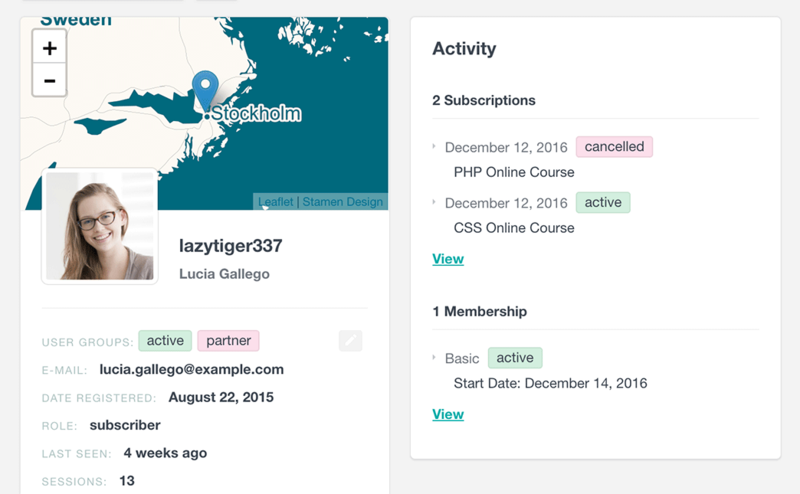 Users Insights makes the status information available by introducing a “Membership Statuses” field. 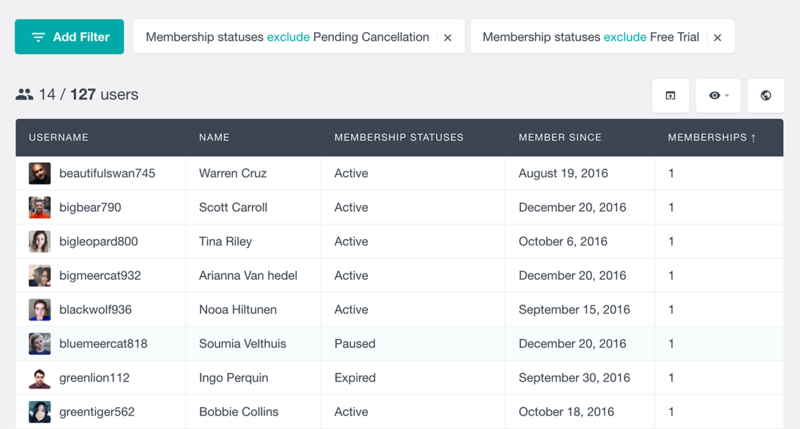 When this field is visible in the table, it lists the membership statuses of each user. When the user has multiple memberships, all the membership statuses are listed, separated by commas. This field is also available in the filters section, which means that it can be used to search and filter the user list by their membership statuses. With the WooCommerce Memberships module of Users Insights you can also filter and search your member list by their membership plan. This is made possible by the “Membership Plans” field that is available in the filters section. Or you could list the members that don’t belong to a selected plan by using the “Membership plans exclude” filter. In addition to the custom fields and filters, the Users Insights user profile section also provides some details about the user memberships. For each user membership, this section lists the name of the membership plan, its status, its start date and end date (when available). This section also includes a “View all” link that opens the WooCommerce Membership list, filtered to show the memberships for the selected user only. The WooCommerce Memberships extension is often used in combination with the WooCommerce Subscriptions extension. When used together, you can create a subscription based membership website and sell memberships with recurring billing. You have the option to set a different content access depending on your membership plans. If you use the WooCommerce Subscriptions extension to manage your WooCommerce memberships, you might also need to retrieve the user subscription data. The good news is that Users Insights also comes with a WooCommerce Subscriptions module, that provides some additional fields and filters like Subscription Status and Next Payment date. Additionally, you can use the default WooCommerce Module to get some more details about the user activity in your shop. You can list the user order data or filter the users by the products ordered (or most likely in your case – subscription products ordered). With the Users Insights export feature you can export any of the fields available. This includes the WooCommerce Membership and WooCommerce Subscription user fields. The export feature allows you to export the user list in the current state – with all the filters applied and the selected visible columns. The export feature can be very useful to create any kind of reports or to import the users to mailing lists. Additionally, you can combine all of the WooCommerce user fields with any of the rest of the Users Insights fields. You could use the Geolocation feature to detect the user locations or use the Last Seen & Sessions fields to find who your most active users are. Another tool that you can use to analyze your memberships is the WooCommerce Memberships Reports. The reports dashboard generates various interactive charts that can help you track and monitor your site’s performance. To learn more about all of the available reports, head over to the WooCommerce Memberships Reports page. The WooCommerce Memberships module of Users Insights adds various useful features and filters that can help you with the management and organization of your membership website. 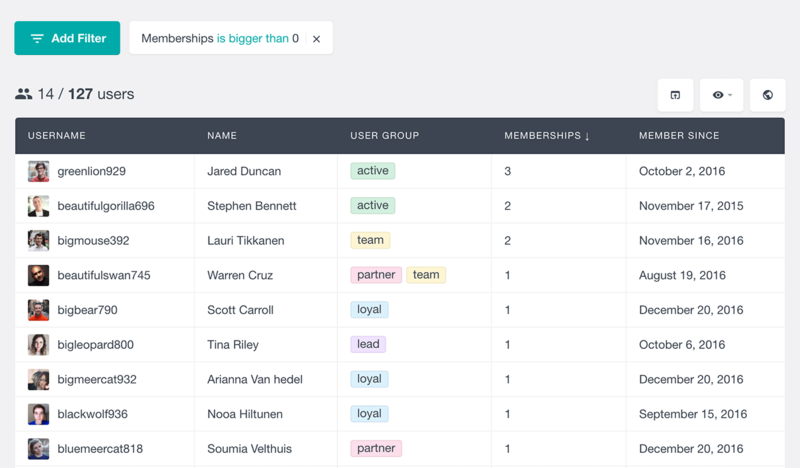 You can now have a bird’s-eye view of who your members are and how they interact with your membership website.